I visited Nutriwell because I was bugged up with people giving me the one only comment that I have great looks and Features like a model but My extra pounds were a negative asset. so I thought to give it a try. When I visited the Nutri well clinic the vibes of Diet clinic was very positive.Staff was very supportive and courteous. They were very encouraging and understood my personal needs regarding my weight. Their plan seemed very easy and natural. But The way they kept me motivated for 6 long month was awesome. I never dreams that I can get a figure of a model. One thing that Dr Surabhi always told me that I will be the next model for their consultancy was the biggest compliment I got :)... 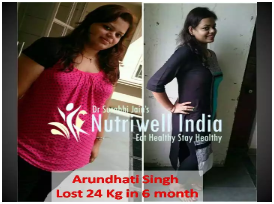 So Now I lost my extra pounds , got that wow figure back and I can definitely say that Nutriwell India is the best weight loss clinic because they work from heart , they are not another money making machine in the market. They will deeply understand your needs , will be available when ever you have a problem and will make whole experience a very easy and wonderful. I would highly recommend their weight loss diet plan.